Want to hang out with stormtroopers from the 501st, sword fighters from the medieval and Renaissance eras, MC Frontalot, and innocent bystanders attending the South By Southwest Festival in Austin, Texas? Then come to our party! SEE the clashing of swords! HEAR the nerdcore stylings of MC Frontalot! DRINK free booze! 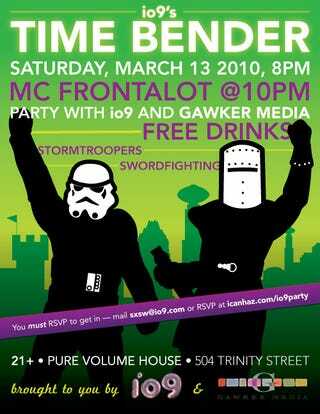 Time Bender starts at 8 PM on March 13 and is 21+. No exceptions. You won't want to miss the brief sword fighting demonstration at 9 PM, featuring fighters from the awe-inspiring High Fantasy Society, and Association for Renaissance Martial Arts. And you definitely won't want to miss MC Frontalot at 10 PM. We'll be located at the lovely Pure Volume House, 504 Trinity St., Austin TX, and will be guarded by members of the local Texas garrison of the 501st Legion (of stormtroopers!). You must RSVP - that's Texas law when there's an open bar. You can RSVP via Facebook, or by mailing sxsw@io9.com. The event is free and open to the public. Space will be limited so don't blame us if you get there late and there's a giant line. It Came From Beneath the Ice To Destroy the World!